Get the party started with this easy Everything Bagel Cheese Ball recipe: all the flavors of your favorite everything bagel turned into a delicious cheese ball appetizer! 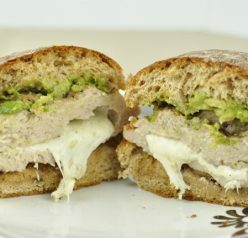 Serve it with bagel chips and watch it disappear. Can you believe that it’s March already? Spring is right around the corner and Easter is not that far away. I made you this Everything Bagel Cheese Ball today. I love different variations of the classic cheese ball and I of course had to put a fun, unique spin on it with this recipe. Come on – you know I can’t just let things be! I mean, why can’t I though? Maybe it’s a sickness. Have you tried my Caramel Apple Cheese Ball yet? Variations of cheese balls are the best! 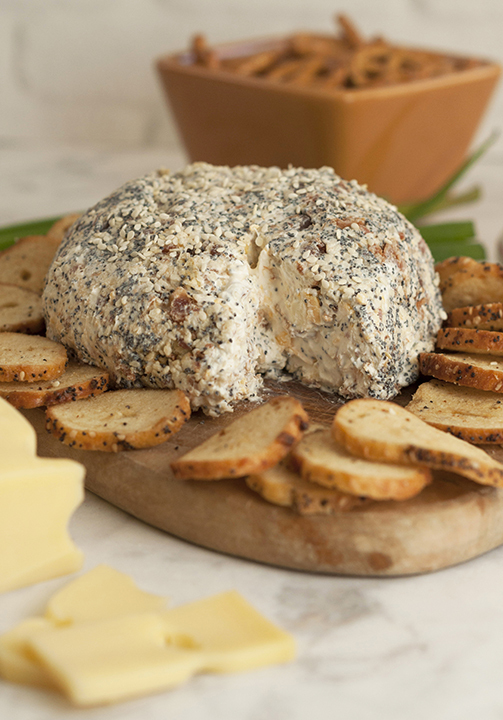 This Everything Bagel Cheese Ball is filled with the most quintessential flavors of your beloved everything bagel: poppy seed, onion, sesame seed, garlic and more. I even served it with – you guessed it- bagel chips! I know for a fact that everything bagels are the most popular type of bagels because every time I go to a bakery in the morning they seem to be out of them…and I proceed to die a little inside. Anytime I make a cheese ball I always try to use the best quality cheese that I possibly can. We all know good cheese makes a difference in taste and texture and can transform a meal, am I right?! I used Jarlsberg cheese in this everything bagel cheese ball recipe as it is the perfect cheese for incorporating into any cheese ball. I snack on their cheese with crackers or just by itself on a regular basis. Fun fact: this is the only cheese my father-in-law will eat! I also made this Toasted Almond Cheese Dip with their cheese which was a huge hit for Christmas Eve last year. Sometimes it’s fun to turn my favorite cheese into a recipe for serving at a party or to dinner guests when they first arrive. I also think this would be the perfect appetizer for the holidays, especially for the Easter holiday coming up. Everyone loves a good cheese ball to munch on! I’m all about the apps (the ones you eat, of course, not the phone apps). Remember not that long ago when we could talk about “apps” and people would automatically know we were talking about food? Jarlsberg cheese is a premium brand still made the same all these years later with the same secret. 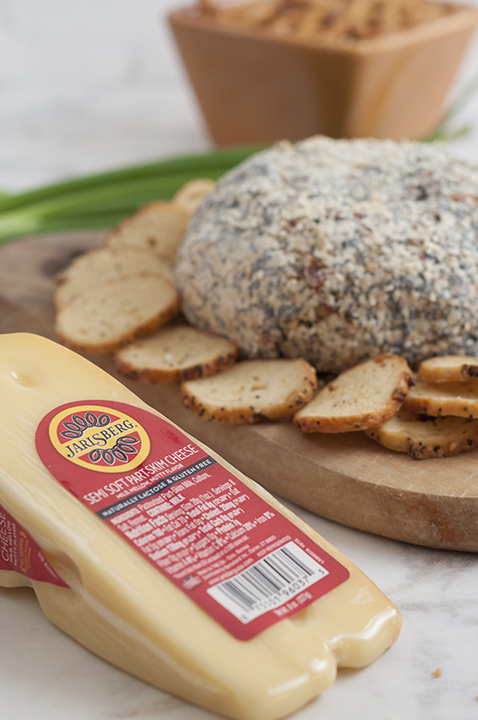 It has been one of America’s favorite specialty cheese brands for over 60 years! I grew up with Jarlsberg cheese in my family, especially during the holidays, and it’s a beloved brand of so many people I know. Nostalgic food is the best kind of food and I plan to keep the tradition going, not just for holidays. Jarlsberg uses a Norwegian recipe developed way back in 1956: the combination of traditional cheese-making and modern technology is what gives their cheese that unique flavor. Did you know the average dairy herd in the U.S. is approximately 187 cows? The majority of the country’s products come from these large farms. However, Norway has an average of 26 animals on their dairy farms. Norway’s clean air combined with their smaller farm size means the animals roam in larger, purer pastures. A lot of their cheese distributed here is made from dairy from cows right here in the U.S.! There is your dairy lesson for the day. The taste of Jarlsberg cheese is mild, buttery, nutty flavor with a very smooth and silky texture. 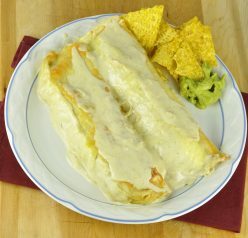 Their cheese is known for it’s distinctive holes and it is a very versatile cheese to use in all different recipes. It pairs especially great with sweet and tart ingredients such as sweet jams and tart fruits. If not using in a recipe, I recommend just cutting it up and adding it to your cheese board the next time you’re entertaining! 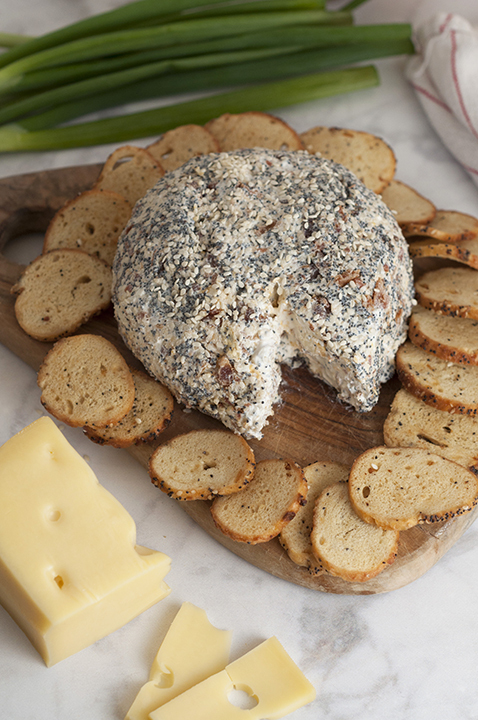 This Everything Bagel Cheese Ball is easy, quick, and you can make it ahead of time. Make-ahead appetizers that you don’t need to keep warm are the best kind, especially when entertaining a group of people. 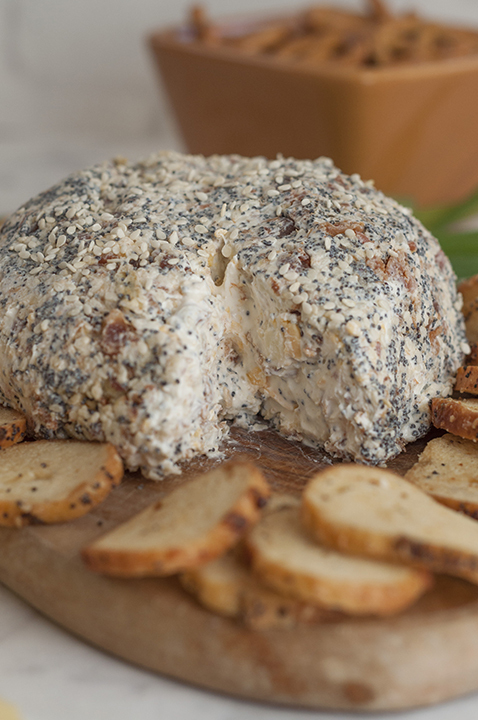 You should really also try my Cranberry Walnut Cheese Ball sometime as it always gets rave reviews. You can find Jarlsberg products in your grocery store’s specialty deli/cheese section! P.S. This may or may not have been my lunch the other day. Oh, and it tasted even better the next day. 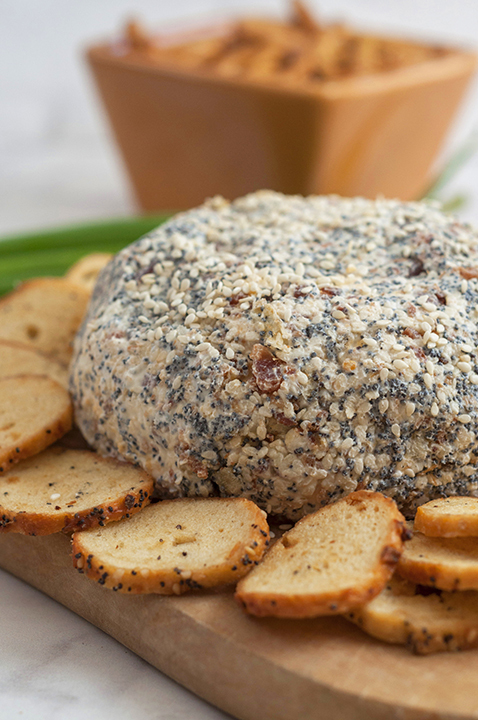 Get the party started with this Everything Bagel Cheese Ball recipe: all the flavors of your favorite everything bagel turned into a delicious cheese ball appetizer! Serve it with bagel chips and watch it disappear. In a mixing bowl, mix together cream cheese, sour cream, Jarlsberg cheese, cheddar cheese, scallions and bacon. 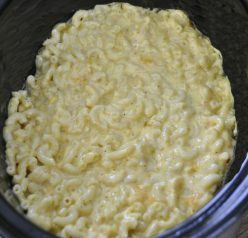 Form the cheese mixture into a ball and wrap it tightly in plastic wrap; chill in the refrigerator for at least 1 or 2 hour to let it harden a bit and the flavors to come together. In another small bowl, mix together the dehydrated onion, poppy seeds, sesame seeds, garlic flakes, salt and pepper. 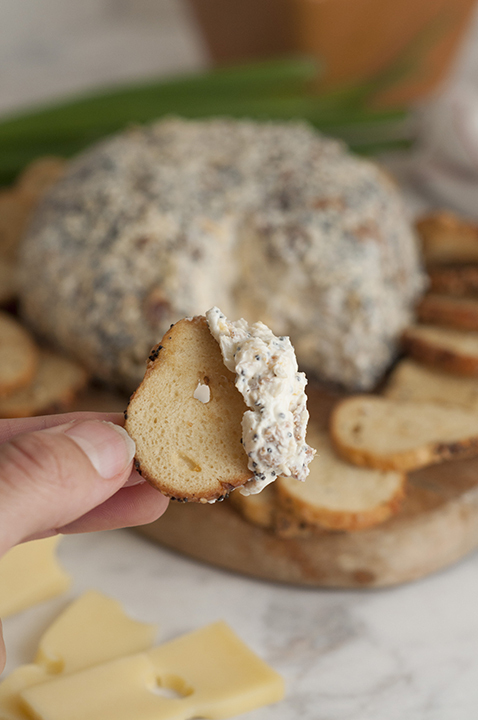 Once cheeseball is set, roll it the cheese ball in the everything bagel seasoning mix that you put together and serve it with some bagel chips, crackers, pretzels, etc. Enjoy! The cheese ball is class and I didn’t my regret my choice of a breakfast bagel one bit. Vegetarian sausage, fried egg and sliced fresh avocado squished in between a bagel, on top of a bed of spinach. Love blue cheese! And cheese balls — they’re so much fun. What a neat dish — love the way it looks, and I just know it tastes even better. Thanks!